As part of the Pinoy tradition, Christmas always came early once the – Ber months hit the calendar. It commences in September until early January the following year. The best part of spending the Christmas season in the country is spending it with family; and it is mostly done over gift-giving, and specially over food. foodpanda, the on-demand food delivery platform has announced the third run of its biggest food sale event: Hot ‘n Hungry – to help make each gathering a memorable one with amazing food deals! The third edition of Hot ‘n Hungry will run from September 1 to September 30, 2018. 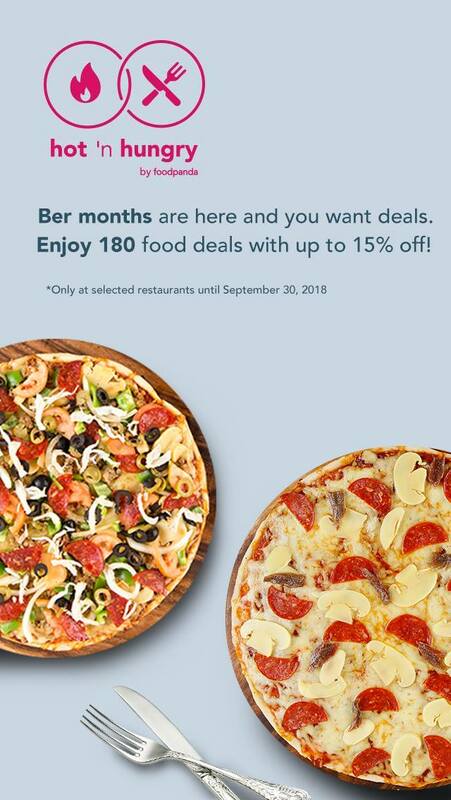 These exclusive and jaw-dropping food deals are available in foodpanda’s three key cities: Metro Manila, Metro Cebu, and Metro Davao. Customers can enjoy 180 deals from different restaurant partners such as Tim Ho Wan, Mesa, Italianni's, Chilis, and Sbarro, with up to 15% off. In Davao, the restaurants that are with Hot 'n Hungry are Classio Mobile Wood Fired Oven, Perch Modern, Dencio's Kamayan, Sundays Modern Home Cooking, and Shatter Kebab + Hummu. It's either they are on a free appetizer or discounted deals.